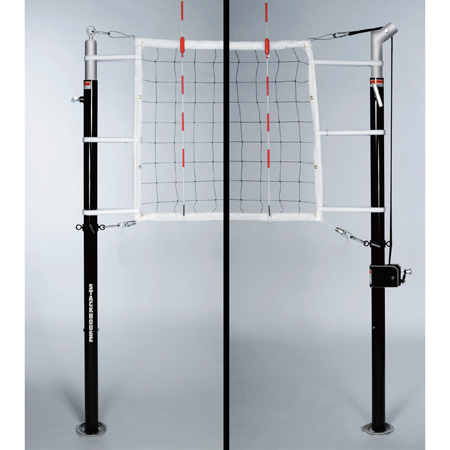 One of the finest competition volleyball systems on the market. This thick wall aluminum 3” system will meet all of your needs for men’s, women’s and junior volleyball competition. Uprights are powder coated black with net height pre-marked on silver powder coated insert. 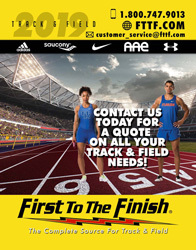 Inserts are easily raised and lowered with the assistance of an internal spring. Insert is held in place using a heavy-duty chromed “T” handle. Fully adjustable lower net collar keeps bottom rope on net secure. Easy to use worm gear winch, uses a 2” wide strap to tighten net to official specifications and insure no kinking of the net cable. Competition quality net meets all USVBA standards and uses steel top cable with wood dowels for end net tension. Stock color: black standards, red pads.